Ticket to Ride came out in 2004. Along with games like Catan and Pandemic, Ticket to Ride helped turn board gaming into the juggernaut of a hobby that we know and love today. It’s for good reason, too. It’s an elegant game that can be learned very quickly. It scales well at low and high player counts. On top of that, the experience for beginners and the experience for advanced players are different enough to keep the game engaging even as you learn more about it. For these reasons and more, we’re going to dive into Ticket to Ride and talk about what new board game designers can learn from this 15-year-old game. Ticket to Ride is all about connecting railways across North America. The longer your routes, the more points you get on the board. You also get points from meeting the conditions on Destination Tickets, which connect distant cities and for making the longest continuous route. It’s very straightforward, but you’re constantly balancing different decisions, which keeps it fresh and engaging. 1. Scale well to different player counts. Ticket to Ride can be played just as easily by two as it can by five players. 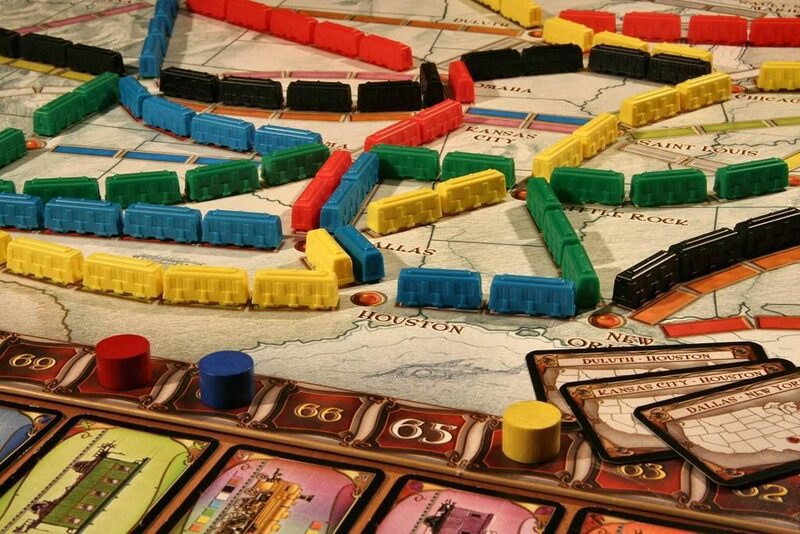 Most games have a pretty defined sweet spot – Ticket to Ride being four players – but often fall apart at low player counts or high player counts. Ticket to Ride simply doesn’t. The framework is simple enough to apply to different player counts without substantially changing rules. This is really valuable because a lot of classic games that came before it had kludgy solutions to try to make low and high player counts work. For games that did this, these “solutions” damaged the overall fun of the game. 2. Create with expansions in mind. At the time Ticket to Ride was created, expansions and alternate versions were not a particularly large part of the nascent board game community. Granted, games like Trivial Pursuit already had a billion editions, but Ticket to Ride wasn’t like Trivial Pursuit. It was a hobby game. Because the framework behind Ticket to Ride is so simple, it became very easy to make alternate versions. That’s why we have Ticket to Ride: Europe, Ticket to Ride: Germany, Ticket to Ride: New York, Ticket to Ride: Rails & Sails, Ticket to Ride: Nordic Countries, and more. There are also expansions both formal and fan-made because the system is so straightforward. Change the cities, change the routes, draw some new lines, swap out Destination Cards. Voila! brand new game with a new strategy based on the quirks of the map. For better or worse, variations and expansions are part of the board game landscape today. If you’re looking to start your own intellectual property that will last far beyond a single game release, Ticket to Ride is an excellent model to look at for inspiration. 3. Allow for different levels of strategy. When you first play Ticket to Ride, it seems simple. All you have to do is connect railways to score points. Meanwhile, cutthroat super-competitors are blocking each others’ railway connections, packing their hands for surprise assaults on the map, and trying to hide their moves so their competition won’t catch on. There are scores of articles on Ticket to Ride strategy, which is incredible when you consider that the game has a complexity rating of 1.87 / 5 on Board Game Geek. Clearly, there is more to it than meets the eye on the first play. As a game designer, this is one of the ultimate objectives of creating a board game. You want a game that works on multiple different levels and stays fresh for a long time. In order to get to that point, you need complexity to come from the interactions between elements of the game instead of the rules. Then you also need to play-test a ton just to make sure that different strategic options are viable. You always want there to be more than one path to victory. 4. Force players to make difficult decisions. Naive new players don’t often feel the burn of Ticket to Ride decision making, but veterans sure do. Alan R. Moon, the creator of Ticket to Ride, put it this way: “the tension comes from being forced to balance greed – adding more cards to your hand, and fear – losing a critical route to a competitor.” There is no strategy that is always right. While you will be making strategic moves on a grand scale throughout the game, you will constantly have to switch up your tactics based on what the board looks like. If your competitors are moving slowly, you have more leniency to be greedy. If your competitors are moving quickly, you have to constantly sweat the risk of getting your rail connections poached. Furthermore, there is the question of where you want your victory points to come from. You can connect cities for points, establish routes for points, but also get points for making the longest route. You’ll need to mix and match, to be sure, but one of these will ultimately wind up being the linchpin in your strategy. You want to be able to pursue goals, but build yourself an out in case you have to switch quickly when you find your opponent is pursuing the same goal! It gets very heady, very quickly. As a board game designer, you want people to feel like their choices matter. Ticket to Ride is excellent at doing this, mostly because the decisions are difficult ones with real consequences. Games need stakes to be satisfying. You need, at least sometimes, to make people feel like opening a door closes another. Hey Brandon, thanks for another great breakdown of a classic game! I’m curious as to how the Ticket to Ride creators were able to make the game enjoyable no matter the player count. Are there certain factors or elements that allow a game to be enjoyable no matter the player count within the suggested range? I’m not sure that there is one factor or set of factors that improve scalability of games to different player count. Simple rules and a lot of playtesting certainly help, though!